Some years ago I created the Croydon Radio events calendar, a popular online directory of all that was going on in or near Croydon. Theatre productions, book launches, courses, talks, kids clubs, workshops, exhibitions, comedy nights and much more were listed in an easy to navigate what's on guide. 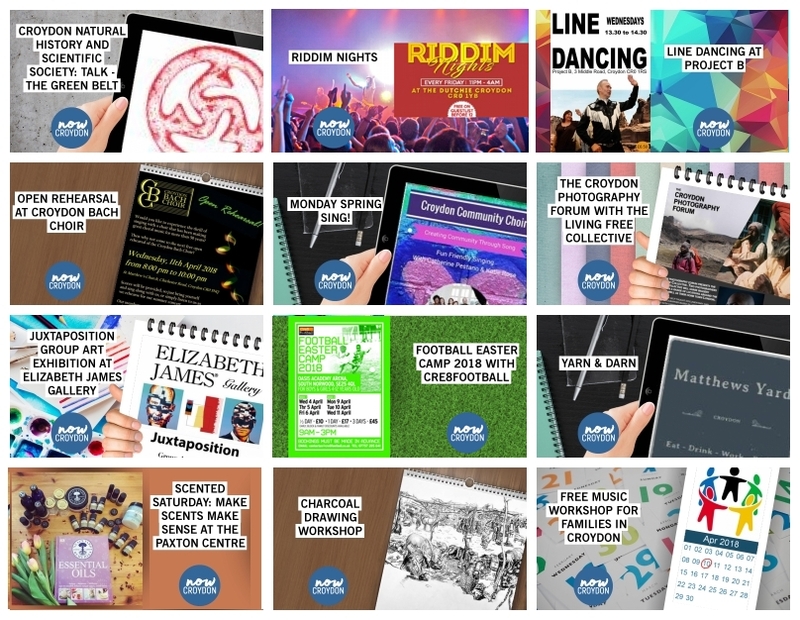 The calendar had existed since the start of Croydon Radio but it was ramped up significantly after the Ambitious for Culture event in October 2014 where I publicly committed to creating a simple to use centralised calendar to promote upcoming activities. The revamped calendar launched the very next day and gained over 200 subscribers in the first 24 hours. The exposure and engagement across our various channels was amazing, with a reach of around 4,000 people each week and over a million social media impressions per month. The online calendar had several thousand visits per day. We knew we had a substantial resource when Croydon Council asked us for a dump of the database for use in a paper on cultural participation. We provided a list of over a thousand activities with contact names, venue addresses and more. The data was generated just a few weeks after the calendar launched. 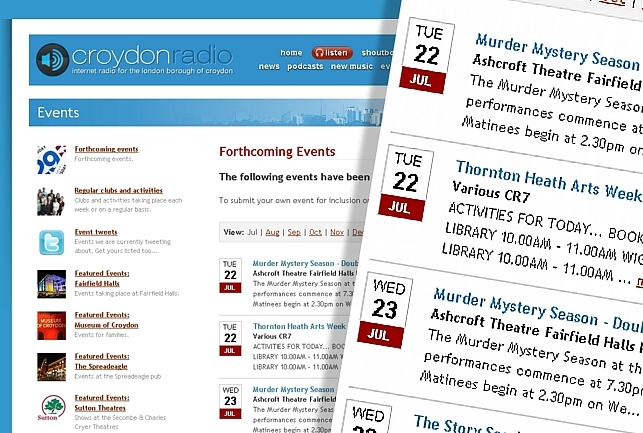 With the closure of Croydon Radio, the calendar was mothballed. This year, I decided to resurrect the calendar idea as part of my NowCroydon website. Whilst many other event calendars have sprung up over the last few years, I wanted to create something that would gather event information from as a many sources as I could find to provide a comprehensive, centralised listing service. The new calendar collects information in two ways. Direct submission by event organisers and by “harvesting events” from more than forty other websites. For direct submissions, we ask simply for an event poster or other hi res artwork. There’s no registration process or cumbersome form-filling. An open source OCR (optical character recognition) routine extracts all the text from the poster. It’s then a short manual process to identify the event title, date, time and venue plus a link to more information which is stored in a database. For the harvesting of event data, we regularly poll over forty websites to extract their latest event details. This requires more upfront work to identify how the data is laid out on each individual website. Once that groundwork is done, the process is automatic and the data can be downloaded and stored with little intervention. 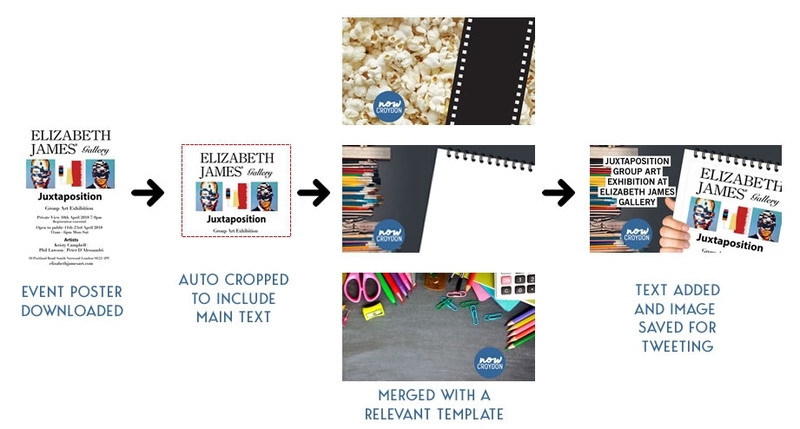 The process is known as screen scraping. It's not without problems (nor a bit of controversy). There is still some manual processing required to spot when the same event is listed on multiple sites with differing titles but it’s quick and painless to review these a few times each week and edit or remove items. The only fly in the ointment is if a website owner suddenly revamps their site and events are listed in an entirely new way. Thankfully, this doesn’t happen so often. To give the event listings a bit of added visual interest, the system also extracts posters and event artwork. These are combined with a number of custom graphic templates I have developed to make them look a little more attractive, particularly when events are tweeted. So, for example, a leaflet might be superimposed on an iPad, or a film poster on strip of celuloid. Creating these images manually would be too time consuming, particularly as the number of events increases. For each event, a number of graphic treatments are automatically produced and I select the one I like most. I'll add to the templates as I have time or when more variety is needed. Each new event organiser and website that is added to the system has its own profile so that its logo, a twitter handle and a range of graphic templates can be incorporated into listings and tweets. The calendar is a labour of love but I enjoy the nerdy task of figuring out how to extract Croydon events from across the web. It's still in its early stages. Hopefully, you’ll appreciate having another source of event information to help you stay up-to-date on all that’s happening in Croydon and further afield. If you want to have an event listed or to have your website calendar “harvested” for data, let me know via the NowCroydon website. Posted by Tim Longhurst on Sun 08 Apr 2018.